You can now use Google Reader from your phone. 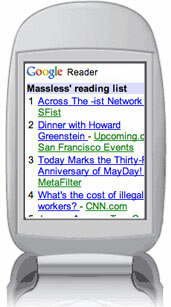 Google Reader can now be placed in your pocket, your handbag, your backpack, or thrown from person to person in a game of "keep away". We've just released a mobile-friendly interface for Google Reader. If you use the Google Personalized Homepage and have installed our Reader Homepage Module, it'll automatically show up on your mobile homepage. Simply go to google.com on your mobile phone's browser and click the link to "Personalized Home". It's great for browsing your reading list during meetings (not that the Reader team is doing this) or while waiting in line to renew your car registration. Good times. I'd like to note that the San Francisco DMV is much faster than it used to be, I waited only 15 minutes last month.